Love this rug. Colors are fantastic, just as pictured. Really changed the look of my room for the better. It’s thinner than the old oriental for the money. 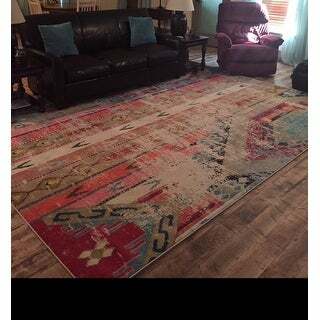 This modern, multicolored distressed rug with a Southwest feel is exactly what I was looking for inside our formal living room. 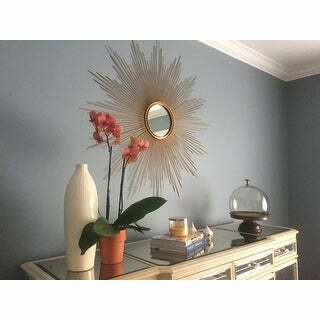 If you are looking for something to pair with neutral furniture, it truly becomes the focal point of the room. The rug is extremely comfortable to walk on and the variation in color helps to hide any pet hair. Looks just like the picture! Great quality! Not the looped rug I was worried it would be. I LOVE THIS RUG!! Even more beautiful than the photo... large & perfect for my living room... comfy underfoot... multiple bright colors softened by "distressing" techniques... no shedding & easy to keep clean... EASY to change decor colors, seasonally or otherwise, with the light & darker hues of blue, orange, red/fuschia, green/yellow, pink/violet, cream, & black!! COLOR makes me happy, so I can't wait to decorate!! 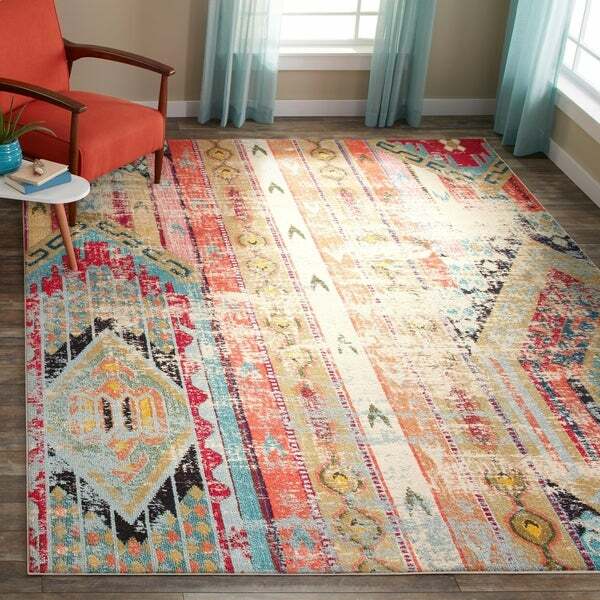 This GORGEOUS rug is very Boho-chic, sunset-colored, spring-inspired, eclectic, tribal, modern, transitional -- ANYTHING you may want it to be!! My style is eclectic; I have pieces in my home that range from very old wooden antiques to mid-century modern furniture to ethnic pieces I've collected from around the world to local artisan furniture and Mexican rustic. For our bedroom, I wanted a rug (we have wood floors) that took up the majority of the floor space but left some of the wooden floor beneath. I also wanted something that looked distressed so it would be the piece that pulled together all the other eclectic pieces I've got in my bedroom. I love that the rug looks as if it's far older than brand new, and the colors really pop out at you. 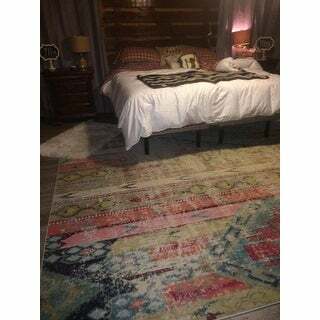 My room focuses on pinks, mauves, blues, purples, and greens, to this multicolored, very much Bohemian rug is PERFECT. I've seen all the questions asked about colors and whatnot. What I saw when I ordered this piece is exactly what was delivered. 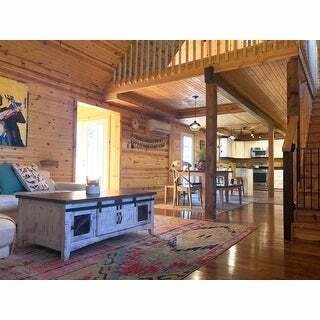 The colors that aren't distressed are bright and cheerful; the distressed areas are just that: they look old and worn (but not tacky). My husband LOVES this rug. Got to admit I wasn't sure if the rug would actually work, but it did. If you dig this style and are pulling together an eclectic or Bohemian style, do yourself a favor and buy it! This rug is helping me transform my old apartment (and hideous stained 10-year-old carpet) into the boho retreat of my *** dreams! 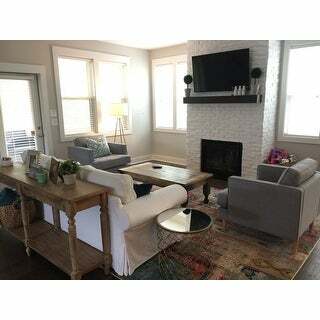 Living room is not yet complete but already looks tons better with this 9x12 rug, I love it! I just love Safavieh rugs they are made to last. Such good workmanship. 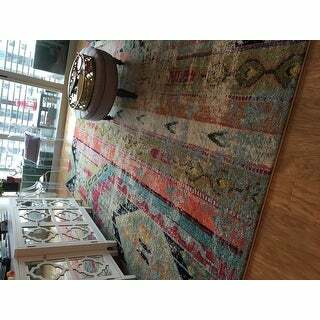 I have purchased several of their rugs as well as order items. 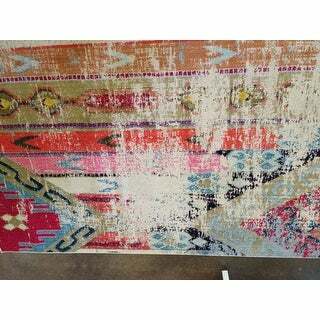 This Vintage Bohemian multicolored distressed rug has so many colors, it will match just about everything you have in your house. Overstock has a good selection to choose from and has always been good to work with. 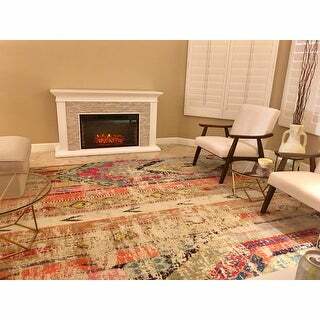 I would recommend this brand rugs and Overstock. I have a house that was built in the 30s and want to somewhat keep with its history in the decor. 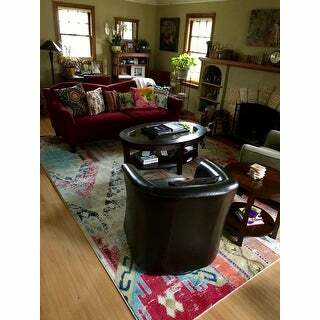 I had a nice, traditional wool, oriental style rug in my living room but wanted something that brightened up the space. This rug brings the room into the 21st century without taking away from the overall feel of the space. The quality is good but I bought a thick Mohawk $100 rug pad, which I would highly recommend. The thickness of the rug without it feels thin and cheap, but the rug pad elevates this rug to an entirely new level of comfort and look. I’ve gotten a ton of compliments on this rug! Such a beautiful rug and arrived very fast! Colors are bright, but there are larger sections of light beige that balance out the color. Great size, price, and quality!! Probably my favorite rug I've ever purchased! This is the absolute perfect rug when you're looking for a nice pop of color. We have a white couch and light gray chairs so I needed something colorful - but not too bright. It's a high quality rug, soft under feet, easy to clean, and perfect if you have kids and animals (the patterns and colors would easily mask any spills or messes!). LOVE IT. This rug is very nice...not super thick, but certainly not lacking in fullness. Be aware that the "wear" spots (intended in the dye process) can be larger than expected and pretty much without color, rather than a faded effect. Funky, bright, and fun. Great rug!!! Really soft!! Love the colors!!!! I like this rug well enough. 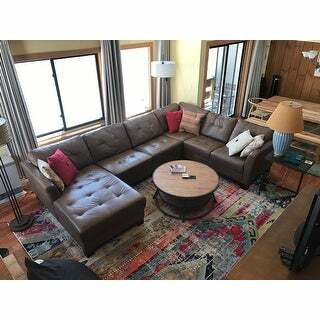 It's more distressed than I would have preferred but it looks great in my ski condo living room. It's a great value for the price. 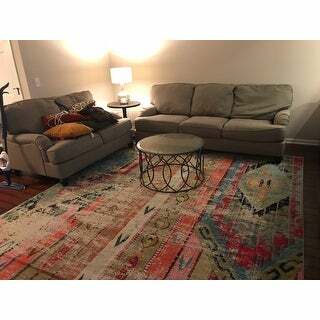 I have had my eye on this rug for a long time and finally purchased it for my living room. I love the pattern and colors. They are bold, but still a bit soft because of the distressing. It does require a rug pad. I really can’t say enough about this rug. It is so gorgeous. 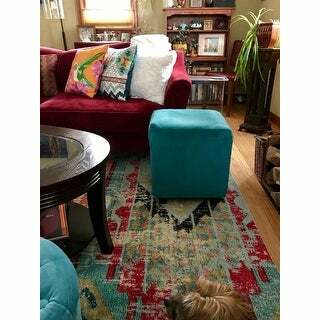 Bright colors and look so great in my living room. Shipping was fast! I will be buying another for my dining room! 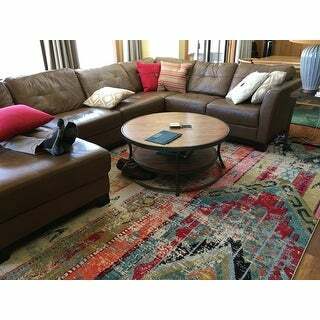 This rug is exactly as picture and it has great quality. Colors are nice, and so comfortable to walk on. It is exactly what I was looking for. Looks just like pictured, a thinner rug, easy to vacuum. Such a beautiful piece! The colors were just as expected and it is excellent quality. I purchase items from Overstock often and would definitely buy this again. Beautiful colors! Looks great in my bedroom. I highly recommend this rug. The rug is soft and plush. With a rug pad under neath it is perfect. Great quality! This is a fantastic rug. I love everything about it. It's high quality and A GREAT PRICE! I have a three-year-old son who is constantly spilling things ... stains seem to be easily removed. Very happy! 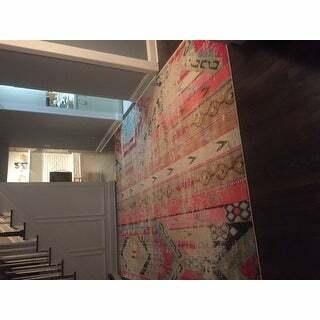 I love the design of this rug but it is not very thick and I have not gotten it to lie totally flat. Also the edging is light beige and the corners were unraveled a bit. I have used fabric glue to glue it back together but the corners are dirty looking even though we are careful not to walk on them or vacuum over them. "Is this soft for young children to comfortably play on?" This rug is extremely soft and feels wonderful under your feet so I would definitely say it would be comfortable for children to play on. Yes, it's very comfortable and it vacuums nicely. I use the floor brush and find no need to use the carpet attachment. I do not think this is a soft rug ! But toys like LEGOS & game pieces etc. won't get lost in it . I used it with the extra nice SCOTCH GUARD 9x12 WARTERPROOF pad so if something gets spilled it won;t go into the flooring. But then I gave it away to a friend who had a more Bohemian look... 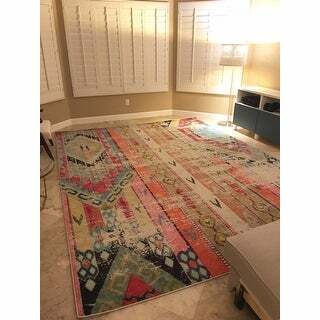 So I ordered another SAFAVIEH Rug 9x12..called HUDSON SHAG . VERY LUSH & deep with a diamond pattern , and I ordered it in GREY,,,which is really lovely neutral in a soft cream & beige that goes with any color. 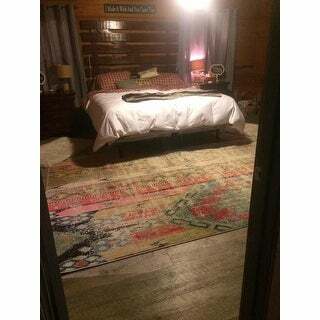 I have also used SAFAVIEH Rugs in my bedroom in FLORIDA SHAG...& one in my den , called DALLAS SHAG (VERY THIN compared to HUDSON SHAG or FLORIDA SHAG).... Hope this helps someone..
"Can anyone who purchased tell me if the red color is more red or pink?" "Is this an indoor only rug or could I put it on a screened in porch? " Indoor only. You don't want it to get wet. "I’m wondering what the return policy is if it doesn’t work for me." For detailed information on our return policy, please see- https://help.overstock.com/#!/answer/1. I returned with no problem! Overstock worked with me! 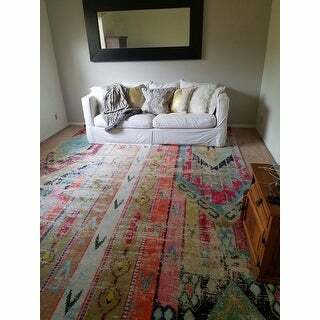 "Is the 9x12 rug pretty close to 9x12 or is it more like 8.5x11.5? Basically trying to ask what the range of difference is in inches. Thanks!" It is a true 9 x 12. "I am wondering how soft this is under bare feet. 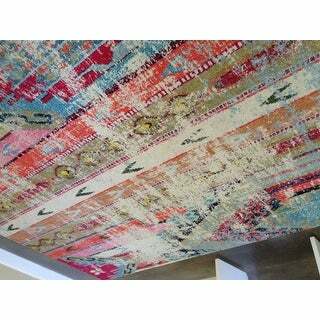 The last rug I purchased on-line was very stiff for a barefoot household." It is not plush, but I would not say that it was stiff. I found it to be comfortable. Not thick, but not thin where the fibers are scratchy and cheap feeling. It’s not microfiber soft but it’s softer than natural fiber rugs (wool/jute). We crawl around on it all day, baby and family. "I am very confused by the description of colors in this rug. Some reports say it has red and others don't. Also, does it have any grey at all in it? The video makes it look like it does." This rug has just about every color you can think of, has a bluish gray and some darker gray! I love the look! There is red and also just about every other color. However, the colors are pretty muted, hence the "distressed." It looks aged and a bit naturally faded, but really interesting and beautiful. If you want bright colors, this isn't it. I love it, though.